The Belgian Paul Marie Ghislain Otlet (1868–1944) from Brussels was an author, entrepreneur, visionary, lawyer and peace activist, and which the most important for us—he is one of several people who have been considered the father of information science. 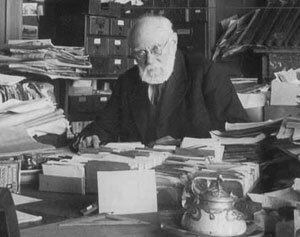 Otlet started his work on how to collect and organize the world's knowledge in 1890s and towards the end of working life he summarized his ideas in two large books of synthesis, the Traité de documentation in 1934 and Monde: Essai d'universalisme in 1935. Otlet's monumental book Traité de documentation (Brussels, 1934) was both central and symbolic in the development of information science (which he called Documentation) in the first half of 20th century. It reminds us also of something that has been too widely forgotten: That this field did have a lively existence in the early decades of 20th century and a sophistication concerning theory and information technology that now commonly surprises people. As early as in 1893, the young lawyer Otlet wrote an essay expressing his concern over the rapid proliferation of books, articles, and periodicals. The problem, he argued, should be alarming to those who are concerned about quality rather than quantity, and he worried about how anyone would ever make sense of it all. Otlet became the most central figure in the development of Documentation. He struggled tirelessly for decades with the most important technical, theoretical, and organizational aspects of a problem, which is central to mankind: How to make recorded knowledge available to those who need it. He thought deeply and wrote endlessly as he designed, developed, and initiated ambitious solutions at his Institute in Brussels. 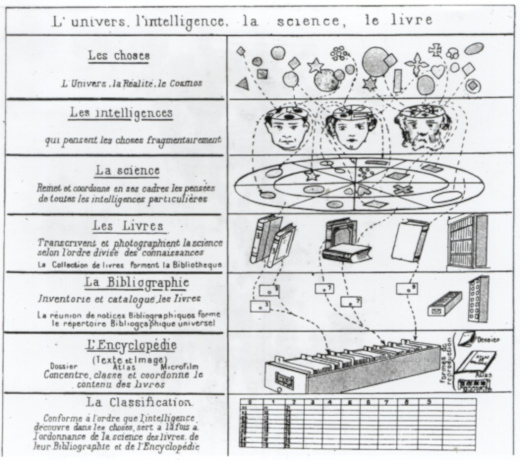 In one of his drawings (see the image below), Otlet illustrates his theory of knowledge: facts and observances about the world are parsed through human brain (les intelligences) to create science disciplines and fields of study, which are then codified in media (books and other written information sources), then classified, to finally form a giant structured library of information. Otlet was also an idealist and peace activist, pushing internationalist political ideas that were embodied in the League of Nations and its International Institute for Intellectual Cooperation (forerunner of UNESCO), working alongside his colleague Henri LaFontaine (in 1895, Otlet and LaFontaine, co-founded the International Institute of bibliography, to promote the efficient organization and dissemination of knowledge), who won the Nobel Peace Prize in 1913, to achieve their ideas of a new world polity that they saw arising from the global diffusion of information and the creation of new kinds of international organization. In 1910, Otlet and La Fontaine first envisioned a "city of knowledge" (Otlet originally named the Palais Mondial (World Palace), comprising a World Museum, World Library, World University, etc. ), that would serve as a central repository for the world's information. In 1906, Otlet and the chemist Robert Goldschmidt, had proposed "microfiche" as a standard format for a "micro-photographic book". Later on, they proposed a portable library of "micro-photographic books". We should have a complex of associated machines which would achieve the following operations simultaneously or sequentially: 1. Conversion of sound into text; 2. Copying that text as many times as is useful; 3. Setting up documents in such a way that each datum has its own identity and its relationships with all the others in the group and to which it can be re-united as needed; 4. Assignment of a classification code to each datum; [division of the document into parts, one for each datum, and] rearrangement of the parts of the document to correspond with the classification codes; 5. Automatic classification and storage of these documents; 6. Automatic retrieval of these documents for consultation and for delivery either for inspection or to a machine for making additional notes; 7. Mechanized manipulation at will of all the recorded data in order to derive new combinations of facts, new relationships between ideas, new operations using symbols. The machinery which would achieve these seven requirement would be a veritable mechanical and collective brain. Otlet wrote expressively of the need for an international information handling system embracing everything, from the creation of an entry in a catalogue to new forms of publication, from the management of libraries, archives and museums as interrelated information agencies to the collaborative elaboration of a universal encyclopedia codifying all of man's hitherto unmanageable knowledge. Central to all of this were the so called Universal Decimal Classification, a new kind of information agency for information management, called the Office of Documentation, a new principle of information indexing and storage, the monographic principle, and microfilm (the idea of providing convenient copies of documents on microfilm dates at least from 1859, when René Prudent Patrice Dagron was granted the first microfilm patent in history. 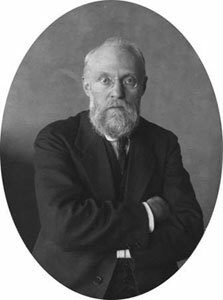 Otlet and the Belgian inventor Robert B. Goldschmidt had proposed standardized microfiche in 1906). Ultimately he foresaw the creation of a Universal Network for Information and Documentation, to which access would be had by multimedia workstations, that lay waiting to be invented just beyond the technological capacity of his time. In the same Traité de Documentation, Otlet predicted that media that would convey feel, taste and smell would also eventually be invented, and that an ideal information-conveyance system should be able to handle all of what he called sense-perception documents. 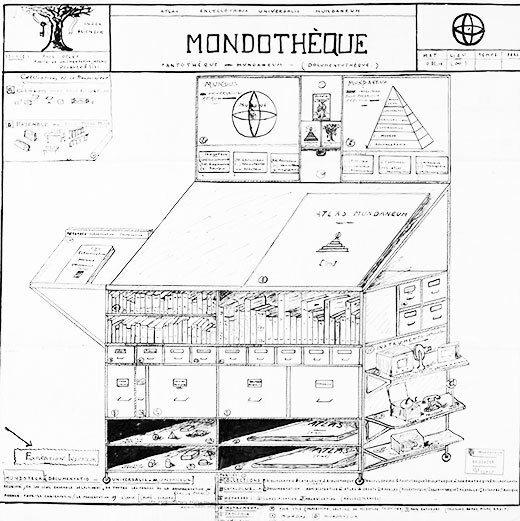 In his l'Encyclopedia Universalis Mundaneum from 1936 Otlet conceptualized and designed a large network, comprised of data centers, called Mundaneum, and multimedia offices, called Mondothèque (see the lower image). Otlet envisioned Mundaneums in various cities all over the world and a large hierarchical network of local, regional, and national centers of knowledge production: Species Mundaneum. The Mondothèque was one link in this network. Otlet designed the Mondothèque as a workstation to be used at home to engage people in the production and dissemination of knowledge. It contained reference works, catalogs, multimedia substitutes for traditional books such as microfilm, TV, radio, and finally a new form of encyclopedia, the Encyclopedia Universalis Mundaneum, comprising reproducible “atlases” involving charts, posters, and other illustrative materials. 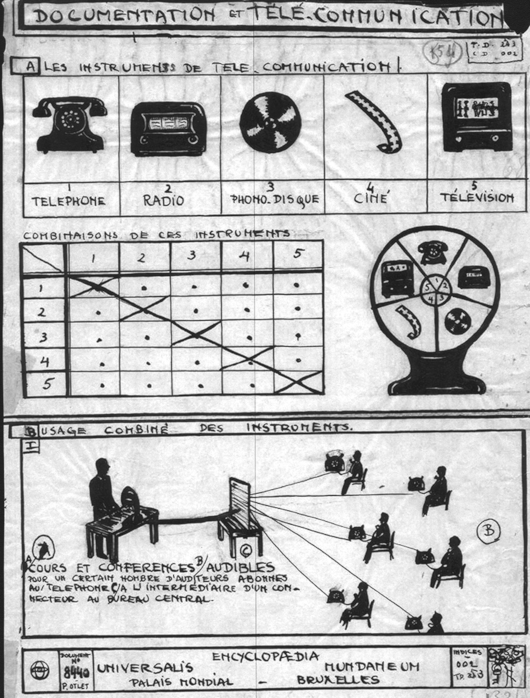 As a base instruments for documentation and communication of Mundaneum Otlet provided the known then media, like telephone, radio, audio disk, cinema, and television (see the lower image). The Mondotheque was thought by Paul Otlet to be a piece of furniture that everyone would have at home, to encourage access but also the production of new knowledge. Made of wood, it combines essential books, atlas boards in the form of visual encyclopedias, small objects (museums in particular), the Universal Bibliographic Directory and its bibliographic records, microfilms, etc. On the side walls of the Mondothèque, we can observe various media of the period represented (telephone, television, radio, phonograph, microphone, etc.) with the functionalities that Paul Otlet imagined already able to combine.